If you haven’t seen this next character before then he may come as a bit of a surprise. But for those of you that recognise the red face, the sawn-off horns and the fist of fury, then you are going to love this. 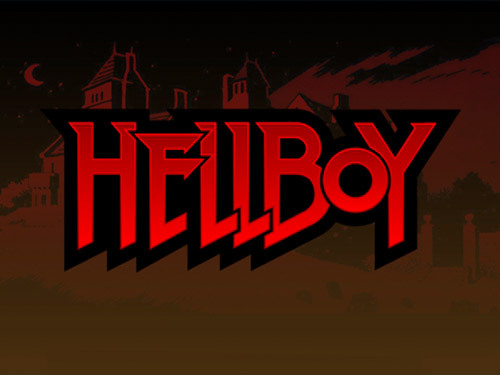 Microgaming have lent their epic design skills and bring to you their homage to Hellboy, so once the credits have rolled the fun can continue. Hellboy is a 5-reel, 20 pay line slot offering a very healthy RTP of 96.49% for players. At a glance the game looks just as if it is set out like a comic strip, with bright animated graphics and a dark mysterious backdrop. Higher value symbols are Hellboy himself, Liz, Abe and 2 other characters from the movie franchise. Lower symbols are the A, K, Q, J and 10, all of which have been given a comic strip overhaul in order to stand out on the reels. Whilst we generally love everything about the game so far, the backing music lets itself down somewhat as there is a distinct lack of it. Music from the movie or even an epic sounding track would have really helped the overall atmosphere of the game as it is played. Bet Amounts – Betting begins at 1p per line in play and can be increased to 25p per line in play. You can also adjust the coin value which gives you a wide range of bets. These range from just 1p per spin at the lowest up to the maximum of £50 per spin, with all lines and max coin value activated. Wild Symbol – The Hellboy logo is your wild symbol and will substitute for all other symbols except the scatter. It is also the highest paying symbol in the game and offers a coin win of x10,000 for landing 5 on an active pay line. 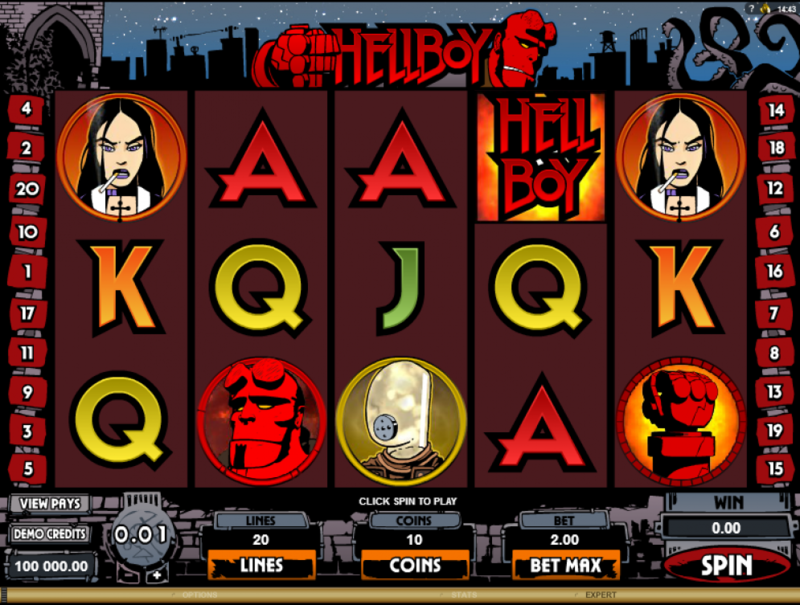 Scatter Symbols – Hellboy’s red fist is the scatter symbol and landing three or more of these anywhere on the reels will trigger the bonus spins. Scatter wins are also available with this symbol meaning by landing 2 or more of the scatter, you will bag an extra win on top of your line win. 5 scatter symbols will award x500 your line bet as a win. Supermode Feature – This feature can trigger at any point during the main game. There is no saying when or what will trigger the feature, but when it does you are going to be very happy. You will be allocated 10 bonus spins to play through with a little extra something to help things along. During the bonus spins you will get either x1, x2 or x3 completely wild reels for the whole round. Underworld Bonus Feature – Land three or more of the Hellboy fist scatter symbol to trigger the underworld bonus. You will be taken to a new screen where you will need to lead Hellboy through various tunnels and levels. Along the way you will fight monsters for bonus prizes, and if you happen to find one of your team you will be awarded all wins for that level. You must complete all 4 levels to be able to reach the relic of power game at the end. This will award a pick em style game allocating one final prize award on top of those you have won along the way. Hellboy is a fascinating game and we think that Microgaming have done well in extending the franchise out into the slot world. There are two very interesting features which is always great to have, especially as one of them is a spins round and one is an interactive choice feature. Wins come fairly regular within the base game and the bonus spins triggers easily enough. Shame that can’t be said for the supermode feature, which despite being randomly triggered is much harder to activate.